Don Meyer – Legendary Student of the Game! With the recent passing of legendary basketball coach Don Meyer, I got to reflect on the trait about coach that I personally admired most. I didn’t really know coach. I met him a time or two in passing and I followed his programs from afar, and over the years have amassed a large collection of his coaching notes that have been passed down to me. 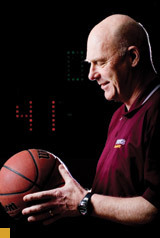 I do though feel very confident in saying that Coach Don Meyer was a leader, basketball fanatic, and what is a rapidly dying characteristic in coaching, a TRUE student of the game! I feel that coaches who are true students of the game are a dying breed and becoming a lost pass time. I came up in coaching when guys wanted to learn each and every little tidbit about the game and were willing to do anything and everything to be around the game of basketball! I drove to countless coaching clinic’s that were packed wall to wall with coaches, took thousands of pages of notes, visited practices, watched videos, worked camps at all levels, called coaches over and over until they had time to visit with me, and watched countless games not for entertainment but to pick up just one new “nugget” for my portfolio of knowledge. I feel that I was and still am a basketball junkie, and I was the norm because if you wanted to have any type of success in this sport as a coach, you had to in essence earned that title per say. I often think of all the coaching network clubs that I was in where I would receive several packets of info each month and in turn would send out my own carefully prepared submission to the group. I still have several file cabinet’s filled with such contents that I regularly refer to. What has happen to the zest for the game? Where’s the passion to learn, grow, and pay your dues, to earn the right to call yourself a basketball coach? We have transitioned into an era where guys want to come right out of college and feel entitled to have a good paying position, where recruiting players is the only skill valued, and getting a Division I job is the only satisfactory option. Guys spend more time trying to become a master networker and the king of politicking at the Final Four or recruiting events than they do learning the game and the business. I see each and every year and have also worked with such cases where people get jobs as basketball coaches but then don’t have the skill-set or knowledge to do their job! This is not good for anybody and most importantly the student – athletes who coaches are supposed to serve. One of the best pieces of advice I was given as an 18 year old trying to position myself to become a college coach was from Bob Huggins who was at Cincinnati at the time. He said, “Don’t spend all of your time learning the tricks of the trade and then not end up learning the trade itself!” I wasn’t 100% sure that I knew what he meant by this at the time but I took in to heart the best I could and as the years have went on it has become more and more clear. Meeting all of the right people and getting every player in America to like you is great and can certainly give you a shot to get your foot in the door. However, if you truly want to have sustained success as a coach (especially at the collegiate level) and to provide value to the players you coach, then like Don Meyer, be a tireless student of the game. Respect the game you love by learning and practicing the trade daily! This entry was posted in Coaching, Education, Inspiration, Sports and tagged Basketball, Bob Huggins, Coach Don Meyer, Coaching, Passion, Recruiting, Sports, Student, Student of the game. Bookmark the permalink. ← Project Positive in the Present!